I like things to be organized, and what better way to organize than in a fun, pretty, and DIY manner! 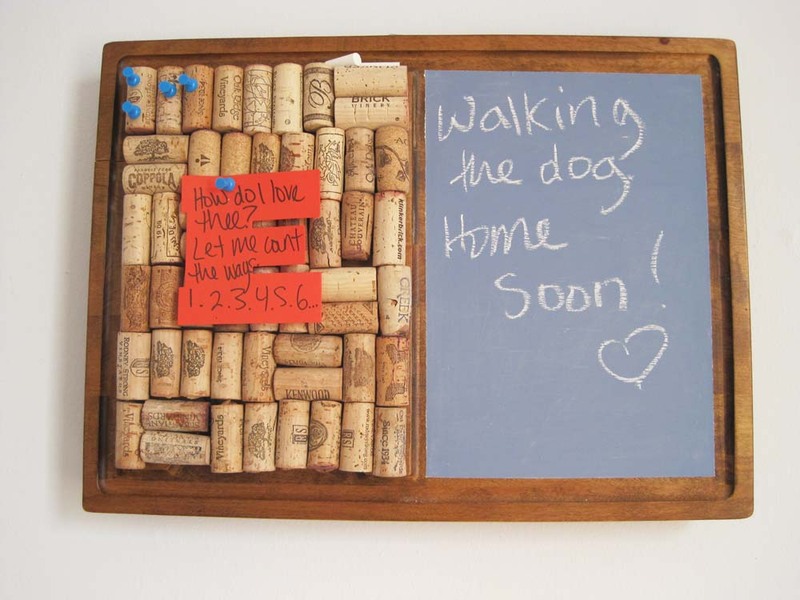 I originally made this cork and chalk message board for my cousin – since she got married in a vineyard I themed her wedding gifts around cork. But I definitely have plans to replicate it for myself since I love the way it turned out! I found a fancy cutting board at a thrift store that was already divided into two sections, but any cutting board or slab of wood will do. Start by washing the cutting board really well. You need a super clean surface for paint to stick well. TSP (tri-sodium phosphate, available in any hardware store) is the traditional choice for getting surfaces (especially walls) clean for painting. There are phosphate-free versions that do just as good a job and are better for the environment, so please use those instead. For this purpose, a good scrub with soap will probably do the trick, unless your cutting board is really grimy or oily, so there’s probably no need to buy TSP if you don’t already have some. Mark off the edges of where you want your chalkboard to be with painter’s tape. Rub the tape down so you’re sure there’s a good seal. Paint a couple of layers of primer, letting it dry in between each layer. Mix your grout into your paint at the ratio of 2 tablespoons of grout for every 1 cup of paint. That’s about 1/2 tablespoon for the little 2 oz paint sampler jars you can buy. Paint a couple of layers of chalkboard paint, letting it dry in between each layer. A hint: If you want to walk away from the project in between paint layers, you can wrap your paintbrush in saran wrap, stick it in the fridge, and it will be just fine to use the next day. Peel off the painter’s tape. Next, arrange your corks on the other side of the board and hot glue them down one at a time. Be generous with the glue since pulling thumb tacks out of the corks does yank on them a bit. I periodically turned a couple of corks perpendicular to give the layout a bit of interest. Double-check that your screw won’t go all the way through your cutting board before you start screwing it in! Screw in the D-ring picture hangers, making sure that they are both the same distance from the top and the side of the board. Measure and cut a length of picture wire that is double the length of the distance between D-rings plus a few inches. To secure the picture wire thread it in a loop through both D-rings and fold each end of the wire back so that it hooks on itself in a complete circle. Then twist each end of the wire around itself to secure. Prime the chalkboard by rubbing it with chalk and then wiping it off. Hang up your finished board and enjoy using it!